Cancer is a complex disease, and the process towards the discovery of a cure is itself complex. It is a step by step process that builds upon previous discoveries and fitting together the pieces of the puzzle until we get a complete picture. 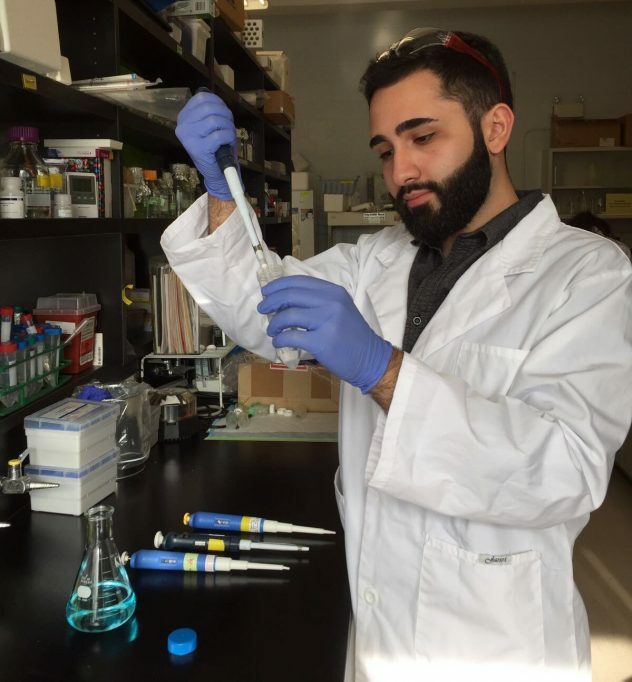 We work at understanding cancer at the most basic level, at understanding how to stop the spread of this disease, and ultimately how we can better treat it and prevent recurrence. While the process can at times seem slow, it is important to remember the gains we have made in recent years working towards eradicating this disease. Breast cancer mortality rates have decreased by almost half since the late 80s, largely due to early screening and better therapy and treatment options upon discovery of cancer. 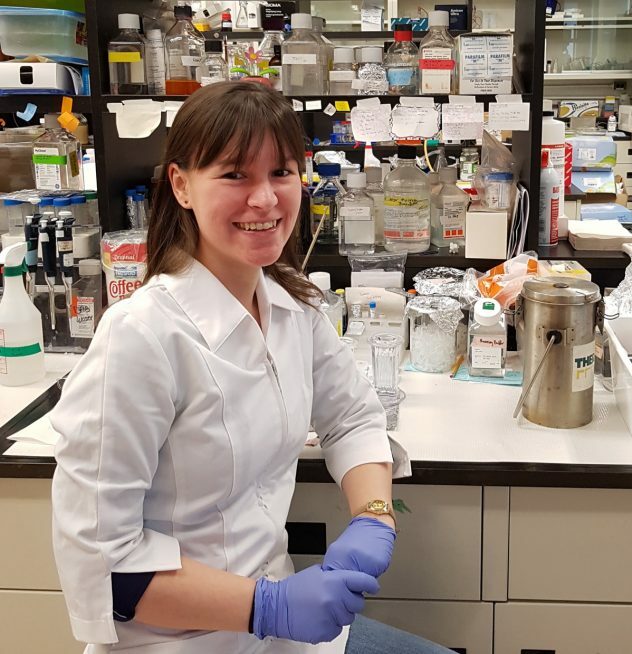 In the Porter Lab we are hard at work, every day working to understand the basic biology of breast cancer so we can contribute to further success rates in the treatment of this disease. In our lab, we study a protein called Spy1 or Speedy. Spy1 binds to different binding partners, called CDKs, to help make cells grow and divide. A part of the research ongoing in the Breast Group is on understanding at a basic level how Spy1 speeds up cellular growth and division. By understanding these basic processes, we can better understand what goes wrong when a cell transitions from normal to cancerous and how to better stop it. We know that Spy1 binding to CDK1 or CDK2 promotes cell division, and at high levels, Spy1 can make cells divide faster. There are times though when your cells need to stop and make sure everything is ok to continue. Cells do this by using checkpoints. You can think of them as the security guards of your cells. Their job is to make sure that everything is good to continue. They’ll spot any problems, like damage to your DNA, and stop the cell in its tracks to fix the problem before the cell is allowed to continue. What happens though, if these security guards miss the problem? This means that damage can be left behind and the damage, or mutation, is passed to the next cell. Over time, mutations accumulate and if left undetected and unrepaired, can allow the cell to grow uncontrollably- a hallmark of cancer. Not only can Spy1 promote cell division, it can also sneak past these security guards in our cells allowing damage to go undetected and accumulate. This creates the perfect storm for cancer to develop. 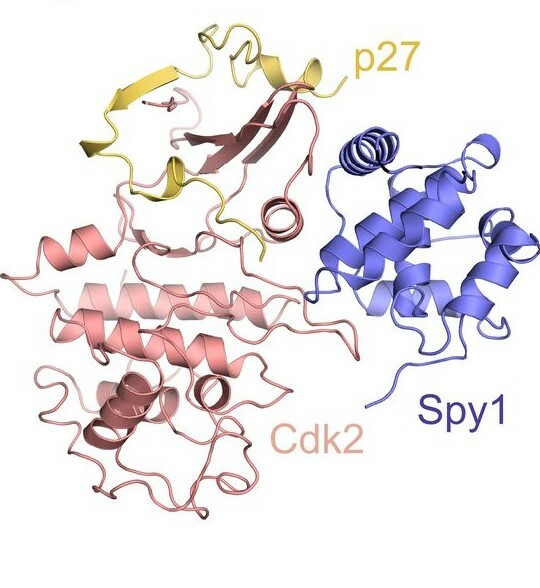 To understand how Spy1 plays a role in the development of breast cancer, we created mutants of Spy1 that are unable to bind to either CDK2 or another binding partner p27. When put into mammary cells that were then transplanted into mice, normal Spy1 was able to rapidly form tumours, while Spy1 unable to bind to its usual binding partners had delayed tumour growth. This work was published last year in Cell Cycle 2016 15 (1): 128-136 and provided novel insight into how we can potentially target Spy1 as a therapeutic option. One problem remained though- we didn’t know what Spy1 looked like. Think of it like this, if the security guard is trying to catch a suspect for sneaking past their checkpoint, they’ll have a hard time putting out a wanted poster if they don’t know what they look like. A description of what they’ve done may be helpful, but to increase the success of catching the suspect, a picture is best. Until recently, we’ve only had a hypothesis about what Spy1 looks like when bound to CDKs. A recent collaboration with Dr. Seth Rubin and his team from the University of California, Santa Cruz this year lead to a publication in The EMBO Journal (2017). DOI 10.15252/embj.201796905 which described for the first time what Spy1 looks like and how it activates CDKs uniquely to ultimately lead to enhanced cell division. This exciting data gives us better insight on how to better target Spy1 in the treatment of breast cancer. Data from our lab and others have shown that levels of Spy1 are elevated in breast cancer and levels are tightly regulated during normal development of the breast (Cancer Research 2008 68 (10): 3591–3600). To truly understand the how and why breast cancer develops, another focus of the breast group is on understanding what role Spy1 plays during normal development of the breast. The breast provides a unique system of study as it is one of the few tissues in the body to continually under different stages of development. There are intense periods of cell division during puberty and early stages of pregnancy, periods when cells stop dividing such as during lactation when cells acquire a different fate to be able to produce milk, and massive regeneration and remodeling of the gland when lactation has ended. Often times, when cells turn from normal to cancerous, they hijack mechanisms used in the normal development and turn it against themselves. Understanding how Spy1 may be regulating normal development will provide great insight into how breast cancer develops and how it can be stopped. To address this, we developed a mouse model that upregulates Spy1 protein levels in the mammary gland, the MMTV-Spy1 mouse, to determine what effects this may have on the development of the gland, and importantly, will this lead to the development of breast cancer in the mouse? The development of the gland was intensely analyzed, and while the cells did divide more as would be expected with high levels of Spy1, the gland was otherwise normal with successful completion of each stage of development, and no spontaneous tumours. One factor may contribute to these findings: susceptibility. Just like in people, some mice are more susceptible to the development of certain types of diseases or cancer. The particular strain of mouse we chose to develop this model on is actually quite resistant to the development of breast cancer. Our next question was, even though this particular strain of mouse is resistant to spontaneous mammary tumours, what happens when we challenge it with something known to drive tumour formation? Do the MMTV-Spy1 mice get more tumours? The answer to this question is yes! When challenged with an agent that can cause tumours, the MMTV-Spy1 mice get significantly more tumours which tells us that elevated levels of Spy1 significantly increase susceptibility to tumour formation. We know that Spy1 can bypass checkpoints in the cell that are used to detect DNA damage, and are investigating how Spy1 is capable of doing this and if this is a contributing factor to increased tumour susceptibility. Additionally, we are studying the interactions of Spy1 with other known cancer drivers to determine if Spy1 can enhance or initiate tumour development in cooperation with these drivers. Since the original MMTV-Spy1 mouse model was generated on a resistant background, we then questioned, what happens when you have elevated levels of Spy1 on a background that is naturally susceptible to mammary tumour formation? We have now generated this mouse on a susceptible model and have exciting data to further delve into the role Spy1 plays in mediating normal mammary development, and what the implications of any alterations in these processes are on the initiation and progression of mammary tumour formation. 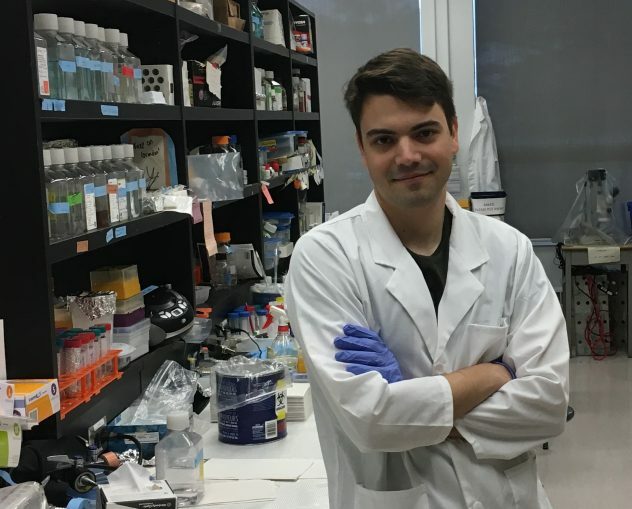 This work is being followed up on by Iulian, a masters student in the lab who is hard at work dissecting the precise mechanisms Spy1 affects to alter mammary development and potentially predispose the gland to the development of breast cancer. To gain further insight into the essentially of Spy1 in the development of the mammary gland as well as tumour formation, we are employing CRISPR-Cas9 to knockout Spy1 in mammary cell lines to answer the question, is Spy1 required for normal mammary gland development and initiation of tumourigenesis? Additionally, we can make changes directly to the genome of the cell and insert mutations in Spy1 that will ablate is binding to CDK2 and p27. 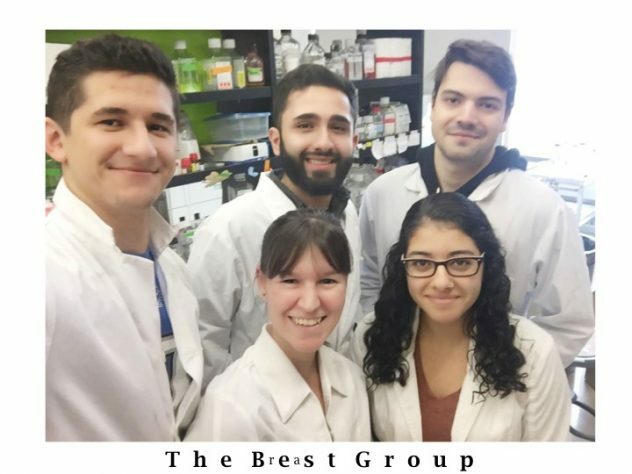 Amy and Catalin, two dedicated undergraduate students in the lab, are hard at work on these techniques and have already produced exciting results that are shedding light on the basic biology and essentiality of Spy1 in the mammary gland. Often times when we think of research, we like to think of it as a straight line that leads from point A to point B or a simple 1+1=2 math equation. Ask a question, do an experiment and you get an answer. More often than not though, this is not the case. Many times, we come up with a new hypothesis, test it and need to repeat and re-evaluate our experiments. This was certainly the case with the MMTV-Spy1 mouse. After developing this mouse initially, I carefully analyzed all aspects of the mammary gland and waited and waited for spontaneous mammary tumours- and since it was on a strain resistant to mammary tumours- not a single spontaneous mammary tumour. At this point, it would have been very easy to have been disheartened with the result. Instead, I saw there were 2 forks in the road-one lead to making the model on a susceptible background and one was testing susceptibility on our resistant background. Lack of spontaneous tumours a resistant background actually provided us with more answers and avenues of exploration than we had initially thought. What was even more interesting though, was that in addition to the 2 forks in the road, there was also a detour sign. Often times in research, the most exhilarating results are the most unexpected ones- the detours. These are the results that you don’t always go looking for and never imagined you’d find. Sometimes it’s good to take the detour and enjoy the scenic route because you just never know what you’ll find and learn. While we set out to study breast cancer using our MMTV-Spy1 mouse, something unexpected was discovered. As the male MMTV-Spy1 mice got older I began to notice that they were very prone to weight gain and something just seemed off. I could have easily dismissed this and just focused my attention on the females as this was the intended area of focus. My curiosity and desire to learn got the better of me though and I decided to look into what I was observing. To my surprise, I discovered that not only were we somehow directing expression of Spy1 to the livers of the male mice, MMTV-Spy1 male mice were developing spontaneous liver tumours! 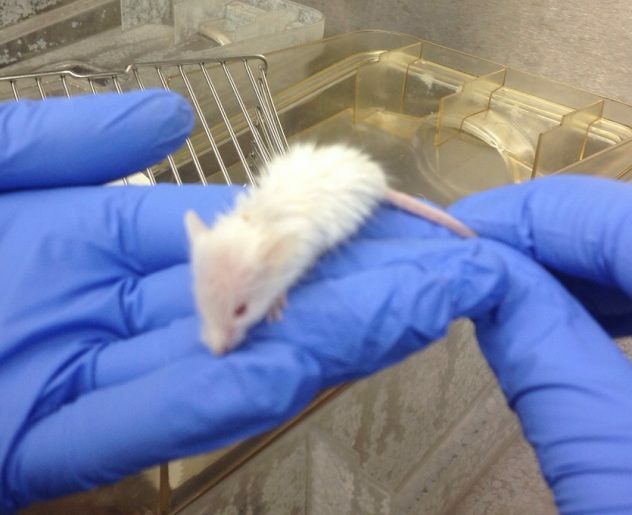 While the mouse strain was resistant to mammary tumours, it turns out, it was susceptible to liver tumours. Some mice without high levels of Spy1 did develop liver tumours as well, but mice with elevated levels of Spy1 developed significantly more liver tumours. This was a completely unexpected finding and has yielded important information about Spy1 in regulating the balance between cellular division and regeneration and other natural mechanisms against injury and inflammation in the liver. 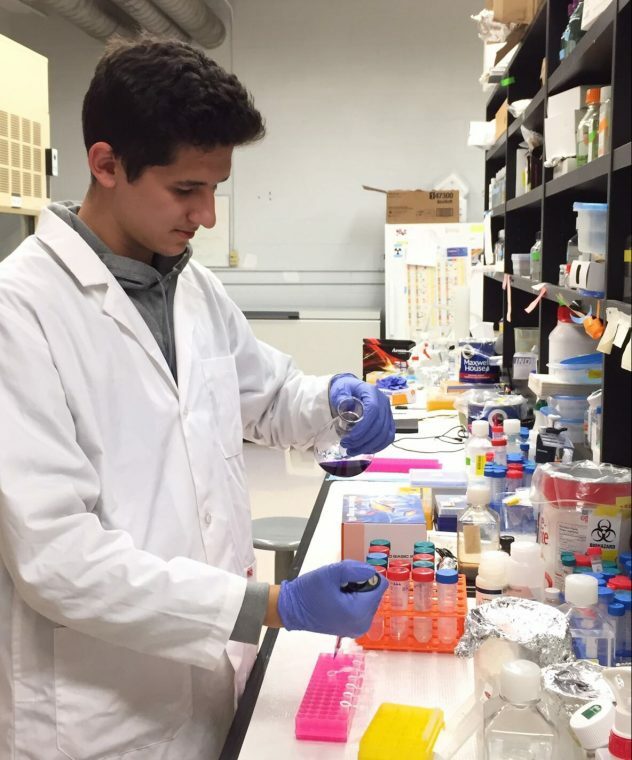 This project has been worked on by a dedicated team of undergraduate students over the years who have taken on the challenge with me to learn more about this system. This project is currently in the hands of an extremely hard-working undergraduate student in the lab, John. He has taken on the challenge of dissecting the precise mechanism of how Spy1 may be enhancing the development of liver cancer. While breast and liver cancer may seem far removed from one another, information gleaned from one system may shed light on what is going on in another system. From both the breast and liver, we know that Spy1 plays a critical role in tumour susceptibility. It may aid in the initial events that turn a cell from normal to cancerous and cooperate with other cancer drivers to enhance this process. As with all tissue types and cancers, the processes may not be identical, but understanding at a fundamental level how Spy1 regulates cellular growth and division will provide novel insight and contribute to our understanding of how Spy1 may initiate and drive tumour formation, and importantly what we can do to stop it in its path. 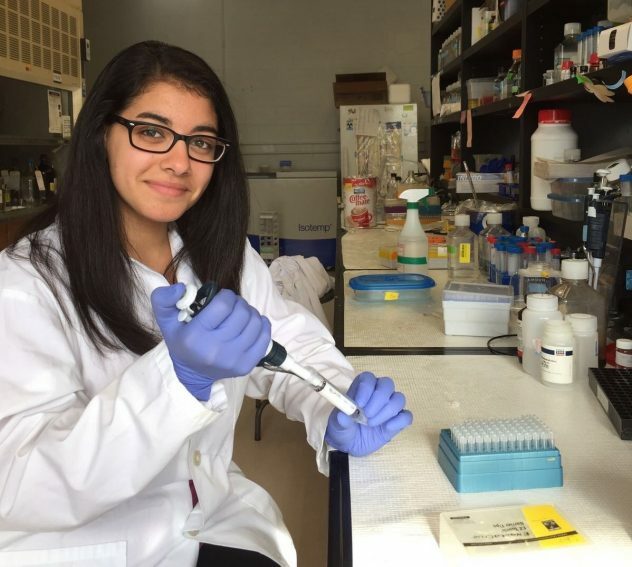 Our research is funded by The Canadian Institutes of Health Research (CIHR) and Windsor Cancer Centre Foundation (Seeds4Hope). I hope you enjoyed learning a little bit about one portion of the breast group and some of the exciting findings! This entry was posted in In the spotlight and tagged Biology, Breast cancer, Canadian Cancer Society, Cancer, Cancer research, Cell Cycle, CIHR, Health, In the spotlight, Liver cancer, Porter Lab, Research, Seeds4Hope, Transgenic mouse, University of Windsor, Windsor, Windsor Cancer Centre Foundation, Windsor Cancer Research. Bookmark the permalink.